PANAMA CITY, Panama -- The 31st WBO Convention in Panama could not be imagined without a thrilling boxing event, and that is precisely what boxing fans and convention attendees will get on October 31 at the plush Centro de Convenciones Vasco Núñez de Balboa in Hotel El Panamá in Ciudad de Panamá. The exciting main event is the intriguing battle between unbeaten, promising, young featherweights, Jean Carlos "Chapito" Rivera (15-0, 10 KO's) of Puerto Rico, and Jason "El Alacrancito" Sánchez (12-0, 6 KO's) of New México for the vacant WBO World Youth Featherweight crown. 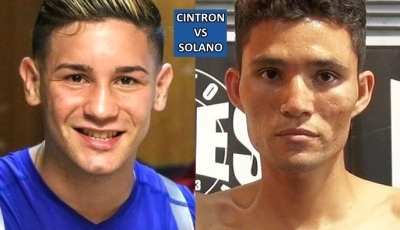 Also, in a battle of experienced world-ranked warriors, José "Páncora" Velásquez (21-6-2, 14 KO's) of Quellón, Chile, faces tough Yenifel Vicente (33-3-2, 25 KO's) of the Dominican Republic for the WBO Latino Super Bantamweight belt. Moreover, unbeaten Argentina fighter "El Avión" Agustín Gauto (9-0, 5 KO's) climbs up to the square ring to take on skilled world-ranked Nicaraguan former world-title challenger Carlos "Chocorroncito" Buitrago (30-4-1, 17 KO's) for the vacant WBO Latino 108-pound strap. In addition, unbeaten world-rated 2-time Olympian Jeyvier Cintrón (8- 0, 4 KO's) of Bayamón, Puerto Rico, defends his WBO Latino 115-pound title against veteran Ricardo “El Matemático” Nuñez 29-8, 23 KO's of La Chorrera, Panama, in a 10-rounder battle that promises fireworks. Furthermore, world-ranked WBO Latino Super Featherweight champion Francisco Fonseca (22-1-1, 16 KO's) of San Ramón, Costa Rica, makes the second defense of his Latino belt against heavy-handed challenger Yohan Vásquez (21-2, 18 KO's) of the Dominican Republic. 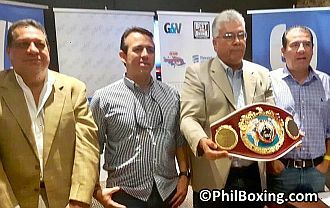 Top photo (L-R): Panama Boxing Commissioner Jaime Salas, PR Best Boxing Peter Rivera of Puerto Rico, WBO 4th Vice President Rolando Marcos Hermoso and Boxing Promoter Diego Victoria of Panama. Moreover, two non-stop action-packed 6-rounder preliminary clashes between young Panamanian fighters are set crank up "Copa Cemento Interoceánico." Undefeated Jaime Valdespino (3-0, 2 KO's) of Curundú takes on Eliécer Tenorio (2-2, 1 KO) of La 24 de Diciembre; plus, Edgardo Avila (1 -1, 1 KO) of Ciudad de Panamá squares off hard-hitting José Beitia (3-1-1, 3 KO's) of David, Chiriquí. Winners will fight each other in the co-main event of next fight card "Box Zona 4" in Panama. This exciting boxing event during the WBO 31st Convention is a production of Panama promotion company G&V Entertainment in association with PR Best Boxing Promotions of Puerto Rico. Tickets can be purchased on the day of the event (Oct 31) or by contacting fulltickets.com. Cemento Interoceánico 100% Panameño, Cable Onda Sports, Centro Comercial Los Andes Mall; Cerveza Panamá; El Siglo, El Periódico del Pueblo; RPC Radio, Telemetro Radio, Caliente 97.1; Super Q; Arrendadora Económica, No 1 en Alquiler y Venta de Autos; Ambulancia Vive and Radio Station Wao 97.5 FM Panama. The author Carlos Costa is a Panamanian Fight Reporter based in Cebu, Philippines. He will attend this fight event October 31 in Panama. Carlos can be reached by email: Carlos512@hotmail.com and WhatsApp: +639184538152.